Finding a dairy-free, egg-free, nut-free dessert is one of my favorite finds. Add in that they are soy-free, Certified gluten-free, parve and fat free, and many more of you can enjoy this delicious frozen dessert! I found them at one of our local discount grocery stores, Grocery Outlet, at about half their regular price. I never know when or what flavor I will find here, so I always grab several packages. 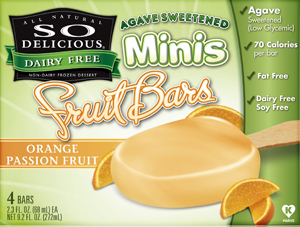 So Delicious, Mini Orange Passion Fruit Fruit Bars, manufactured by Turtle Mountain, LLC., P.O. Box 21938, Eugene, OR. Ingredients include: WATER, ORGANIC AGAVE SYRUP, PASSIONFRUIT JUICE CONCENTRATE, ORANGE JUICE CONCENTRATE, CHICORY ROOT EXTRACT (INULIN), GUM ACACIA, COCONUT OIL, CITRIC ACID, PEA PROTEIN, XANTHAN GUM, NATURAL FLAVORS, LOCUST BEAN GUM, ANNATTO. Packaging ALLERGEN INFORMATION: Turtle Mountain applies strict quality control of measures in an effort to prevent contamination by undeclared food allergens. To assure our preventive measures are effective, we sample test our products for the presence of dairy, gluten, peanut, almond and soy allergens using state of the art testing methods. To learn more about our allergen prevention program, visit us at www.sodeliciousdairyfree.com. 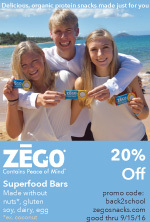 For more information about their products, visit: SO delicious Dairy Free or 1-866-388-7853. Be sure to click on the Feel So Great link on their homepage to learn more about their protocols for allergen testing, equipment cleaning and packaging. Excellent find! 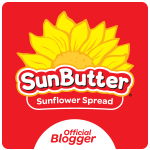 this is what I love about our food allergy community, you find something fabulous and now that means I found something fabulous! Thanks for helping out my weekend get started. Thanks for taking time to post and hope you can find them locally! There are a variety of delicious flavors, and we like them ALL!